This makes me queasy. And I have to go to Richmond Hill tomorrow! The 111 St A station is a disaster, save for the refurbished entrance. And guess what, this is after $billions have been borrowed for maintenance. What happens when all the money goes to interest, leaving nothing for maintenance? Pick my jaw up off the floor is right. Methinks the MTA’s explanations are less than forthcoming here. 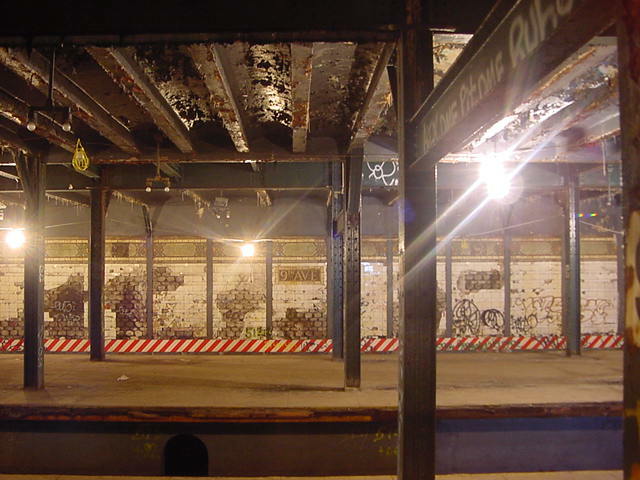 From the standpoint of a subway, there is nothing easier to reach than parts of a structure that have been abandoned – because there are no trains to worry about! If there is no train traffic, and no active third rail, then an inspector has all the time in the world to perform comprehensive structural analysis. If the rails are still in place, then inspection can take place from the bed of a work train. If the rails have been removed, then a rolling scaffold can be constructed, or even a personal man lift used. They can even work a normal day shift! As structural inspections go, this would be luxurious. The MTA should be embarrassed by the IG’s report. This should shock no one ( remember what happened in Washington Heights with the ceilings on the 1 Train ?). The reality of the matter is the MTA and politicians are interested in NEW projects that will go on for decades instead of fixing up what we have already. An obvious example is politicians wanting Madison Square Garden to move, so they can build a new Penn Station, this is a project that will not happen until the 2030’s (at the earliest). You can debate whether or not it is needed, but it should not be the priority at this point in time. I agree on MSG, but don’t agree in general. As overpriced as they are, the new projects such as SAS and ESA are a small share of total spending, and will be a small share of total debt service. Of course new projects SHOULD HAVE been the only projects borrowed for. One can say that one irresponsible generation, the one that cashed out and moved to the suburbs, left us with a lot of physical deterirotation. The next, the state legislators who drive everywhere in live in NYC as they would in Darien, left us with a little physical deterioration and a lot of financial deterioration. We find out in 2015 is we’re going back again. A new Penn would not be an MTA project, even though they use the station. Since any major work on Penn is predicated on moving the arena it’s a discussion that has to happen now as their permit is up for renewal. It would seem the MTA really needs to reorganize and streamline how it does inspections and prioritizes repairs. Remove steps from the process and create a system that ensures all components are looked at on an appropriate schedule, clearly define everyone’s areas of responsibility. Using a little common sense would be good too. Not doing proper inspections to structures because you don’t have the right equipment means they need to actually BUY (or borrow from other MTA agencies) the right equipment instead of avoiding doing the work. This provides support to let planned fare hikes go into affect, even if the are not needed immediately. When there are funds shortages, the first area impacted is maintenance. There also needs to be some directive to put any surpluses (or a % of the surplus into maintenance). Any maintenance, especially if it can be accelerated, will have the best long term payback, even if it is the least obvious. As a structural engineer, I can assure you that a) we design to whatever requirements are in the building codes and b) that chief engineer’s “overengineered” comment is one of the reasons that building codes have factors of safety built into them. Keep in mind that most of the subway system was built more than 80 years ago. Much of it might not even meet today’s codes. A significant seismic event could be catastrophic – both above and below ground. It depends on where you look. Due to limited understanding of forces, some infrastructure built 75-100 years ago were built to extreme safety margins. Look at Brooklyn, Hells Gate, and George Washington Bridges. On the other hand, many structures built then have since failed or were replaced. Overengineered systems, like all things man has designed and built, also have vulnerabilities that can cause failures. Case in point, water damage, especially infiltration with significant amounts of dissolved ions (esp in the presence of electrical currents) can greatly accelerate corrosion, and rapidly reduce structural margin. This is why the water infiltration in tunnels with high water tables, (esp brackish ground water) can be highly detrimental. The underwater rail tunnel flooding during Sandy exposed the cast iron rings to seawater and sewage. The salt and bacteria accelerated corrosion in a humid environment is something the MTA needs to pay attention to. The problem is a compounded version of Robert Moses Syndrome — Elected officials and others with governmental power don’t particularly like building underground structures, because nobody can see them like they can a bridge or a huge new development like Hudson Yards, and that goes double for actually maintaining those underground structures (els aren’t much better, but if they pop a rivet onto the street, they do get people’s attention). It’s why they can spend billions on the Calatrava head house or design ornate, non-functional things like the Fulton Transit Center egg and not feel bad about sinking money into that instead of things underground, that are more necessary but which people can’t see. Frills get funded; preventive maintenance, not-so-much. On Wednesday morning at about 730, there was a huge downpour of water directly onto the ( underground, Brooklyn bound ) R platform at Jay Street Station. The water was going directly onto the florescent light fixtures. Don’t know if that is the result of any deferred maintenance or from bad design of something ( perhaps relating to the R/A/F connector construction ) but this was/is not good. With the fare model now in use, is it hopeless? The system is too old, there’s too much that needs to be done, and work is too expensive. Maybe something radical like the Kheel plan is needed. I look forward to the day the 7 train I’m in suddenly becomes a streetcar. Wonder if it will still beat the Q32/60 to Queensborough Plaza while running on the ground.